Just got back from Morocco yesterday and it was amazing – both because of the sites i saw and the wonderful people i met. I’ve never been to africa, and although some people consider north africa more like europe then central or southern africa, it was definitely unique. The primary language is arabic, which has its own way or writing and speaking unlike any european language (so you can’t guess meaning like you could italian if you were spanish). However, french is also spoken and most signs are in french as well. Luckily the nicer hotels and restaurants also speak english (as well as most other european languages). Our group of about 20 consisted of mostly people from the US, but also spain and morocco. This diverse crew made the trip fun, interesting, and ten times more enjoyable than if i did morocco on my own. We started off in Casablanca where othman’s family, the Laraki’s, live. I’ve never met a more hospitable family – between driving us around, sharing their home, serving us the best food in morocco, entertaining us with their entire family and good conversation – i would have loved to just stay with them for my vacation! But of course i would not want to wear out my welcome. 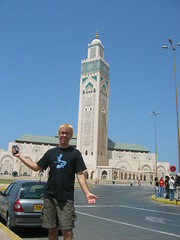 Casablanca was merely the starting and ending point for our trip – we had many things to see. The biggest attraction in casablanca was the Hassan II Mosque – the 3rd largest in the world (after the ones in Mecca and Medina). It was amazing – holds 25,000 people on the inside, took 10,000 people 7 years working 24/7 to make. To the right is a shot of me in front of it. After Casablanca we flew to Ouarzazate (pronounced where-za-zat .. 2 turntables and a microphone). This was the start of our journey to Erg Chebbi, the most beautiful sand dune in the world. Our travel package included 4 SUVs to take us the 400+ km to the sand dune, and on the way i was fortunate to be in the one with Taj, our guide. He unloaded lots of facts about morocco as well as the sites we saw while driving. Most interesting was the nomads – Taj said there were about 300,000 people in the towns in the central valley, and another 200,000 nomads – which are called berbers. My book (lonely planet morocco) said that 70% of moroccan people have berber blood. The berber people are quite wealthy, traveling all around with tons of sheep and goats, making nice carpets and rugs as they go. Once a year in the fall they all meet up for about a month for courting – then they get married, and if that one month was enough time and a couple wants to get a divorce, they must wait till the following fall before doing so. Taj said that this makes most of them sort out their problems and they stay married. Until a few years ago, women would get married around age 14 and men around age 16. Now its age 18 for both. The sand dunes were amazing. Most of the 7ish hour journey there was on paved roads, but the last hour or so was on desert rock and sand. Then we slowly started to see these red sand dunes rising up in front of us. We arrived shortly before sunset, the almost full moon was already out, and we immediately got out of the cars and hopped on camels – 2 tourists per camel, one berber walking in front. Man, camels really have big camel toes. It was a 15 min ride to the top of the dunes, where we all got out and sat on the top to watch the sunset. Beautiful. Before we got back on the camels, we were encouraged to buy some fossils from our individual camel guides – fossils were about 240-480 million years old, formed when the area was under the sea. I bought something that resembled a spiral – one thing i should point out it is how good these guys are at bargaining. Not just the camel dudes, but everywhere – moroccans love to haggle and they are amazing at it. Later that night we ate, drank cold beers, and sat by a bonfire under the sand dunes and got to know other people in the group. A wonderful day. On the way back we stopped in this gorge where natural springs fed a small river. I stuck my entire head into the cold water, soaking my shirt and most of my shorts. Being that we were in the desert, i was completely dry in about 20 minutes. But the temperature was way over 100 degrees (40-45 °C) and stops like this make you feel alive again. The next city was Marrakesh, one of the most popular moroccan destinations. It’s great because it has world-class hotels and restaurants, but still has markets in the old town that have been operation for hundreds of years – a trip back in time. The marketplace (aka souks/medina) is HUGE, with pretty much anything you want – clothes, cell phones, IDs, jewelry, goat heads, spices, fresh squeezed OJ, late night snacks .. plus street performers, actors, snake charmers (yeah, real cobras), henna artists, and random camels. I purchased 2 moroccan robes (djellaba), one with and one without a hood. The ones with a hood make people look like jawas from star wars. Actually, I’m pretty sure george lucas got all his ideas for the first star wars from morocco – music in that tatooine bar, camel talkings, and especially the x-wing fighter. Ok, not that last one. Seeing how this is my vacation, a time to relax, i also thoroughly enjoyed dinner at Bo Sin (? ), one of the best restaurants i’ve ever visited. The moroccan/thai food was delicious, but the atmosphere was unequaled. The temperatures are perfect at night in marrakesh, so bo sin has large glass doors that just open up to the back revealing bamboo trees, lanterns, and concrete paths surrounding islands of tables, chairs, and couches for both eating and lounging. Later we hit Pasha, a club similar to a 1015 or ruby skye in SF. Apparently there’s a chain of them in europe, one of the guys in our group from spain, ramon, said the one in madrid was much better. The last stop was Essaouira, the moroccan beach town about 300km south of casablanca. By this point i was getting tired of the 100+ degree days and the mild temperatures were a very welcome change. The city itself is quite old, a natural port that was used in slave trading hundreds of years ago. Today its mostly a tourist destination, a hugely popular beach extending 1-2 km, but also containing souqs similar to marrakesh. The weekend we were there also happened to coincide with a music festival, showcasing lots of moroccan talent. We spent some time on the beach, walking the maze of alleyways, but mostly at a bar called Taros, which was on the roof near the main square where we could watch the ocean, the beach, or the music festival below. Taros also had its own live music both nights we were there, and i got my groove on a few times. A nice relaxing way to end the trip. Special thanks to othman for organizing such an amazing trip.